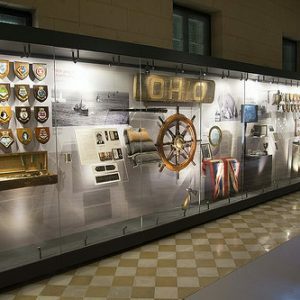 Wall-hung display cases are applicable to exhibition for light,small or medium artifacts.Hung up and fixed from the back to solid wall through the integrated mounting systems, this showcase design not only creates the diversification of museum exhibition but also makes the most of space and saves space.The solid wall fabric will effectively absorb and support weights from display cases and displayed exhibits. 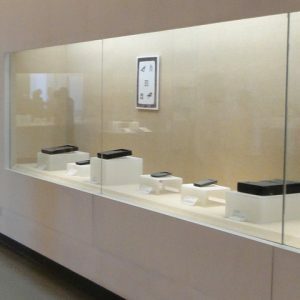 With solid wall as support, display cases are hung onto wall, with display case sizes to be customized. 5 glass sides of glass front/left/right/top/bottom or 4 glass sides of glass front/left/right/top for wall-hung cases.In compliance with EN356-P4A, the glass are laminated with 4 layers high intensity PVB film interlayers between 2 glass panels.Low-iron ultra clear glass or imported anti-reflective glass with reflectivity less than 1% and light transmittance more than 97%.High fabrication precision and polished glass edge.Glass panes are frame-lessly bonded by clear neutral UV sealants. Skeleton of plinth to be built by low carbon structural steel of square steel and/or rectangular steel,seamless zero-oxygen welding.Folded steel panel works as external cladding. Eco-friendly and inert materials with no VOCs released for non-hazardous internal display space. Durable,waterproof,rustproof,anti-fire and eco-friendly epoxy resin powder coating for the surface of all metal parts. Lockable lower lower base for silicon gel tray for passively-controlled RH 40%-60%, or discretely-installed electronic microclimate system for actively-controlled humidity 20%-80% and air purifying.